← Film Night has been postponed. Tickets £10.00 Normandy Cider on arrival plus rations. Proceeds to Royal British Legion. 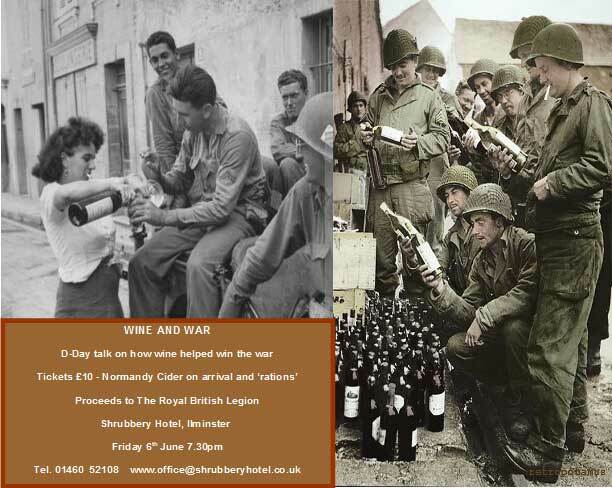 A talk given by a wine expert Linda Vejay, come and join us on this fascinating subject and support our soldiers. Description: Wine and War. D Day Talk on how wine helped win the war. Tickets £10.00 Normandy Cider on arrival plus rations. At Shrubbery Hotel Ilminster. Proceeds to Royal British Legion.